9 November: what a day. Did you know that on 9 November 1985, Garry Kasparov became the youngest ever undisputed World Chess Champion by defeating then-champion Anatoly Karpov? Four years later, a wall fell. Back to chess. Ready for game 2? @_cyberella:“I have a box of chocolates, fresh coffee and Carlsen – Anand streaming on the laptop. It’s a perfect Sunday”. Hmm, Sunday is also Premier League day, too bad that the organizers planned game two today: @TarjeiJS:“One of Carlsen’s closest friend saying he wants to win quickly today, because of Swansea-Arsenal starting at 5 (CET)”. @nigelshortchess:“Reti was right: 1.e4 is just a blunder” and added: “I am quite glad I chose to finish my lunch rather than rush back home for the opening moves”. @anishgiri: “Sad necessity of modern chess. Back in the days a6 Bxc6 was considered nothing, now Magnus tries it even without a6”. @fabianocaruana: Even without a6 he can enjoy memories of his game vs Grischuk. It’s only 1 tempo after all. And now… in the middle of the game…we have to leave you for a commercial break…. @Rfed1: “Dei, this is absurd. They have scheduled ad breaks and you are forced to watch some Russian crap for 10 minutes non stop”. And after the break…what happened to the wall? Hikaru Nakamura is watching the match from sunny California and tweeted: @GMHikaru: “Strange moves by Anand in the middlegame. In particular, the knight almost always belongs on e6 in these exchange Ruy structures. 18…Ne6!” And what do you think about the position, @FabianoCaruana: “This is very nasty for black. And exactly the type of position where Carlsen is at his most ruthless”. Caruana could be the next challenger, right? 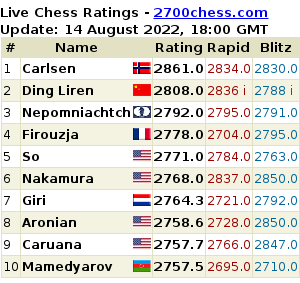 @mousa_bander tweeted: “In 2016, carlsen-caruana , in 2018, carlsen-giri, In 2020 carlsen- stockfish”. @MagnusCarlsen was all smiles after the game:“Nice way to end the weekend…” and showed a selfie with his sister Ellen. A perfect Sunday for the world champion? Àlmost. Remember the tweet about Swansea-Arsenal? A lot of people watched football this weekend, many people in Norway watched chess: Spurs fan @TarjeiJS has the exact figures for us: “218,000 Norwegians followed Carlsen-Anand on #nrksjakk this weekend, 52.000 more than in Chennai. (via @Aftenposten)”.